A product so popular that it is even difficult to get!? “Ryukakusan Direct”, evolved version of “Ryukakusan”, the old stand-by sore throat remedy. 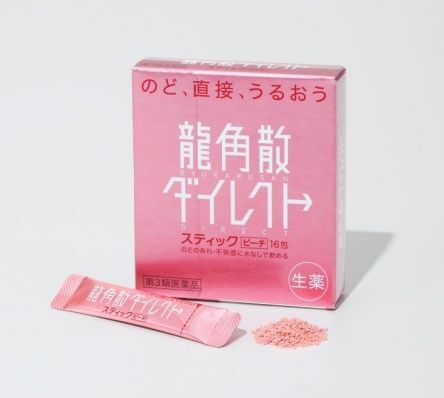 “Ryukakusan” is the old stand-by sore throat remedy that has been loved by everybody with the well-known phrase, “Cough! What you need is Ryukakusan”, since it was born in Japan around 200 years ago. It has been sold in Taiwan and Korea for 50 years. It is now a “Global Brand” selling about four times the domestic market in Asian countries. Many foreign media refers to it as “a must-buy medicine in Japan”. It encourages foreign tourists to bulk-buy this product. The evolved version of “Ryukakusan”, “Ryukakusan Direct” series was released in 2008 and has been getting a lot of attention since then. “Ryukakusan Direct Stick” is granulated powder type. It can be taken easily even by those who cannot take superfine powder medicine like “Ryukakusan”. A stick packaged medicine can be taken anytime, anywhere. Three to six times usage a day is recommended for an adult. It doesn’t contain sugar, free from the worry of tooth decay. 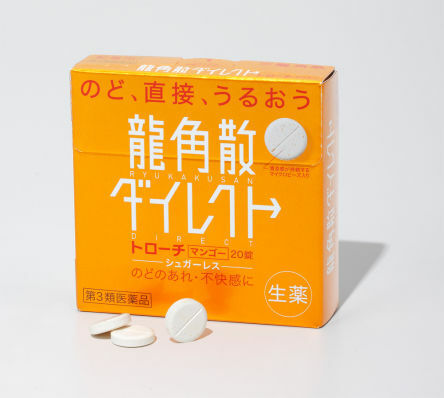 To soothe the throat irritation and sore throat, “Ryukakusan Direct Lozenge” is recommended for a long-lasting effect. Slowly let it melt in the mouth without chewing. The mango flavor lozenge can be taken as casually as eating candies. ・Powdered herbal medicine works directly on the throat. ・It has few side effects. ・It should be taken without water. Effective for PM2.5 and hay-fever. 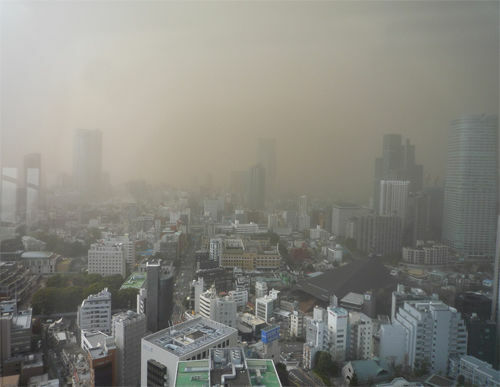 In spring, the atmosphere can often be polluted by PM2.5, Asian Dust, cedar or Japanese cypress pollen. More and more people began to claim that their daily lives are affected by this pollution. Many people have coughs and throat irritation caused by Asian Dust, and the air pollution by PM2.5 is getting more and more serious problem. Once microscopic substances like PM2.5 enter the human body, they are absorbed in the lungs and spread harmful substances into the veins. Lungs don’t have any self-purifying system. The harmful substances once taken into the body can never be removed. Inside the human trachea is covered with ciliated cells that produce mucus. Dust and bacteria came in through the airway are absorbed by this mucus and discharge from the body by the movement of the cilia. When this function doesn’t work well because of the inflammation caused by the polluted air or talking too much, you will be suffered from coughs. 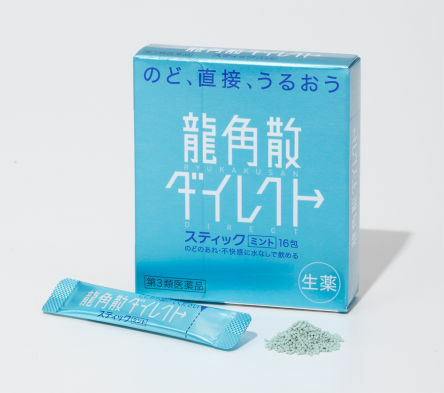 Taking “Ryukakusan” without water will enhance the mucus production, discharge harmful substances, virus and bacteria from the body together with coughs and phlegm, eventually soothing coughs and inflammation. “Ryukakusan Direct” can be taken casually when you feel like “My throat condition is not great” or “I feel throat irritation because of the bad air today”. If you have a big day for your business, take it the night before. It will save your voice on your important day. Take “Ryukakusan” and keep the rich, smooth voice for the important presentation! Having a smooth throat, and the conversation between lovers can be more fun! “Ryukakusan Direct” is effective against hoarse voice after talking or singing a lot. Many announcers and voice actors are said to be using this product. It is the reliable product which has easy texture to take, refreshing taste, and no side effect of causing drowsiness. Choose the one to fit your purpose! Stick type and Lozenge type. It contains powdered herbal medicine to soothe sore throat and throat irritation. Granule powder type that can be taken anywhere, anytime without water. The herbal medicine will work directly on the damaged part. Phlegm, cough, hoarse voice caused by throat inflammation, sore throat, throat irritation. Adult (over 15): 1 stick per dose, 11 to 14 years old: 2/3 stick per dose, 7 to 10 years old: 1/2 stick per dose, 3 to 6 years old: 1/3 stick per dose. Do not use for children under 3 years old. Maximum 6 sticks a day. Take without water. Wait at least 2 hours before the next use. 2 kinds of flavors, peach and mint are available. For safe and correct use, carefully read “Precautions” and follow all directions. The only existing lozenge containing powdered herbal medicine. It has refreshing taste of mango and menthol. It is sugar-free lozenge with long lasting refreshing effect that is ideal before romantic date. Not only cool hairstyle and good skin care, but also rich, soothing voice will surely enhance your charm. Phlegm, cough, hoarse voice caused by throat inflammation, sore throat, throat irritation and swelling. Adult (over 15): 1 tablet per dose, 5 to 14 years old: 1/2 tablet per dose. Do not use for children under 5 years old. 3 to 6 tablets a day. Wait at least 2 hours before the next use. “Ryukakusan Direct”. Refresh your throat anytime, anywhere without water. The effective way to soothe your throat irritation. ※The article above does not indicate the editor guarantee the effects of any specific product.